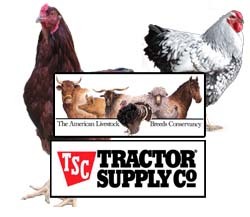 The American Livestock Breeds Conservancy (ALBC) is pleased to announce a new promotional partnership with Tractor Supply Company (TSC) that will raise awareness of endangered and heritage poultry breeds. Beginning in March 2011, over 1,000 Tractor Supply stores across the country will participate in the annual Chick Days program. This year, the program will include a number of heritage breeds of poultry, many of which are considered endangered by the American Livestock Breeds Conservancy. As part of the partnership, the American Livestock Breeds Conservancy has provided research, information and technical expertise, helping Tractor Supply to share the message of heritage breed conservation with their customers. The United Nations Food and Agriculture Organization estimates that 21 percent of livestock breeds worldwide continue to be at risk of extinction. The American Livestock Breeds Conservancy is the only organization in the United States working to stop the extinction of these breeds – ensuring the future of our agricultural food system. In 2011, the American Livestock Breeds Conservancy listed over 188 breeds of livestock and poultry on its Conservation Priority List, a list that designates population levels for endangered domesticated breeds. Twenty-nine poultry breeds were listed as critically endangered, making the TSC partnership an even more important step in the promotion and conservation of heritage breeds. Tractor Supply Company is the leading retail farm and ranch store brand in America. Founded in 1938, Tractor Supply Company operates more than 1001 stores in 44 states supplying daily farm and ranch maintenance supplies to a targeted customer base. The Company’s stores are focused on supplying the lifestyle needs of recreational farmers and ranchers. The Company also serves the maintenance needs of those who enjoy the rural lifestyle, as well as tradesmen and small businesses.